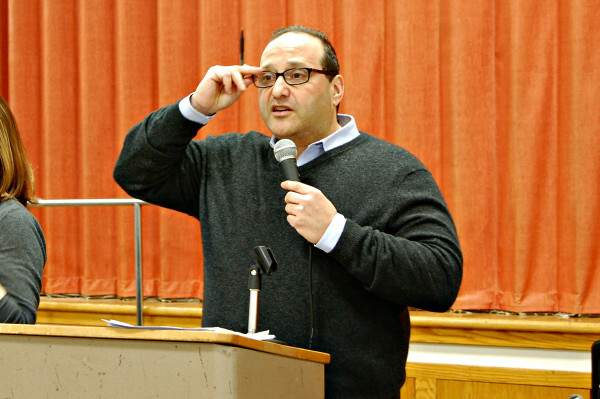 Bangor Councilor Joe Baldacci moved Monday evening to delay consideration of his proposed local minimum-wage increase until after the November election. BANGOR, Maine — Without majority support, Councilor Joe Baldacci moved Monday evening to delay consideration of his proposed local minimum-wage increase until after the November election. Baldacci’s motion came immediately after it became clear he did not have support from Councilor Ben Sprague, who raised questions about how the ordinance would deal with nonprofits, tipped employees, small businesses and other details. “This would be … a major ordinance change, and I don’t believe we have had time to fully vet it yet,” said Sprague, who called it a great policy debate and thanked Baldacci for leading it. Going into the meeting, Sprague was the lone undecided vote in what was otherwise a 4-4 matchup on the minimum-wage issue. While Sprague would not support Baldacci’s ordinance as is, he would not oppose delaying its consideration to keep the issue alive. The motion, which refers the ordinance to the council’s Business and Economic Development Committee meeting on Aug. 18 and returns it to the council on Nov. 23, passed in a 6-3 vote. Supporters included Sprague, Baldacci and Councilors Patricia Blanchette, Sean Faircloth, Nelson Durgin, Gibran Graham. “I will not vote to cut off discussion on a topic that people still care about talking about,” Sprague said. “I don’t know if I’ve ever had an issue where I’ve heard from more people than this one,” he said later. Opponents included Councilors Pauline Civiello, David Nealley and Josh Plourde. Nealley said Baldacci’s motion had purposefully made the November election a political litmus test on the popular minimum-wage issue. “For that, I think that’s almost a perversion of public policy,” he said, pointing out that most councilors support increasing the minimum wage and that they only disagree on whether it should be done at the municipal level. Baldacci said he was delaying because he was more than happy to “go the extra mile” to answer questions and fine-tune the ordinance out of respect for other councilors. He also said that the council’s initial reception to the ordinance was “very cool” and that he had been forced to fight just to have a public hearing on the issue. “Within the last 30 days there were efforts to prevent a public hearing from happening,” he said. “This is an important issue. There’s no reason we’ve had to fight just to have a public hearing on this issue,” he said later. Baldacci’s motion to delay comes after he fought off attempts by Civiello and Nealley to keep the ordinance in committee last week. It also accounts for the anticipated absence of Blanchette, a key supporter of the minimum wage measure, who expected to be absent the rest of her term, which ends Nov. 9. Blanchette plans to move to Florida next week. Approximately 80 people attended the meeting, though no public comments were taken as the council did not vote up or down on the issue. The state has not increased the minimum wage since 2009, meaning the lowest-earning workers have been losing to inflation. If the state’s first uniform minimum wage enacted at $1 per hour in 1959 had kept pace with inflation, it would be $8.20 per hour today, according to the U.S. Bureau of Labor Statistics.